On a bright sunny day last February, Carl and I attended a dedication service for a new church (Local Church Branch) of Ekklesiyar Yan’uwa a Nigeria (EYN, the Church of the Brethren in Nigeria) just outside of Michika. 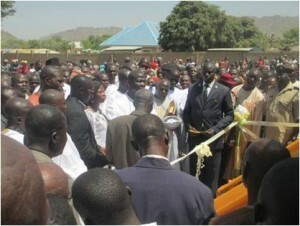 The atmosphere was festive and the people were excited to imagine what God would do at this new church. There were so many of us at the dedication that we had to gather outside for the prayer. Photo courtesy of EYN Nigeria. Fast forward to the outlook today. – The church branch has been burned, the roof caved in and the people who would have attended have been displaced. But… God is still sovereign and he knows the past, present, and what the future holds. Despite the devastation and destruction, God’s people will continue to meet where they can. On Christmas Day 2014, in Mubi, a town 60 miles from Michika, displaced persons returned and held a service outside their burned church. With the Nigerians, we continue to pray and we continue to put our hope in Jesus Christ. 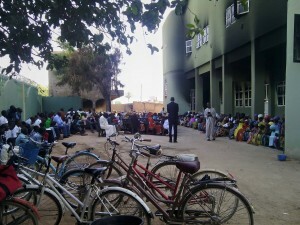 Christmas Service outside of a burned church in Mubi. Photo courtesy of EYN Nigeria. A look at the horror of what everyday life in NE Nigeria has become. Last July the small community of Wagga was attacked by the Boko Haram. Over three hundred of these terrorists came into the village riding on motorbikes and in cars. Most of the Christians fled the village realizing that they would become the primary targets if they stayed. 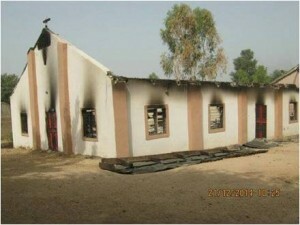 After a few days, the Boko Haram returned and burned the churches in Wagga and did the same in the larger community of Madagali, which is close by. Although EYN is the largest church presence in this region, not only were EYN churches destroyed but also those belonging to the Church of Christ in Nigeria, Assemblies of God, and the Roman Catholics. There were eight EYN churches burned. 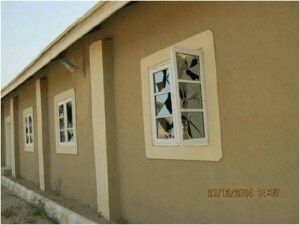 The Boko Haram militants settled in Madagali leaving only a small contingent in Wagga. Since it was just Muslims left in Wagga, Boko Haram called all the Muslim men, “Come, let us pray together.” They issued an ultimatum, “Who would like to join us?” A handful agreed to join. The rest asked for time to consider the invitation until the next day. Boko Haram immediately took nearly two hundred of the men, old and young, to a large hall. They were separated into groups of ten. The first ten were killed with an ax, the next ten killed with a cutlass and the third group killed with a gun. Then the process was repeated over and over. Later one of each ten was granted “mercy” and so fled. The most elderly were spared and those under fifteen were incorporated into Boko Haram and trained as new fighting recruits. The slaughter led some who had volunteered to reconsider and later escape. In Wagga the small Muslim community had prayed five times each day. They removed their shoes and washed their feet before praying as do most Muslims. Boko Haram prays just once each day, about seven in the morning, and leaves their shoes on while praying. Boko Haram did not kill the women when they came to Wagga, but took all the food from the houses leaving nothing for the women. Sarah (not her real name) was a single parent farmer, growing groundnuts, red and white beans and maize. Now she was rarely able to leave her home. When she did she was required to so cover her head that neighbors could barely recognize her or she them. The few Christian women still in Wagga made a pact with the Muslim men who remained that they would live together, not as married couples but as cover from Boko Haram. Those men were able to slip away at times to grind grain for the women to eat. When Boko Haram first raided Wagga Sarah had fled to safety in the mountains. She returned when she realized her thirteen year old mentally challenged daughter was missing. She remained in Wagga for the sake of her daughter who was later brutally raped by Boko Haram in the six intervening months. The population of Wagga and Madagali has now almost evaporated to only about two hundred people in the two communities. The day after Christmas Sarah awakened at 11:00 in the night and a vision told her to run for safety. She and one of her friends, who agreed to join her, fled to the mountains. Surprisingly they found forty-three other women and two men who had similarly fled from other places. They crossed safely into Cameroon to Mokolo village where they found some immediate assistance. Then again as a group they crossed the border and found refuge in Yola. From there Sarah came to Jos where her brother has been caring for two of her young children who had escaped in July. She does not know whether her daughter is still alive but she does praise God for the chance to again see her people.